They are fierce, they are fast and they play a contact sport on roller skates! 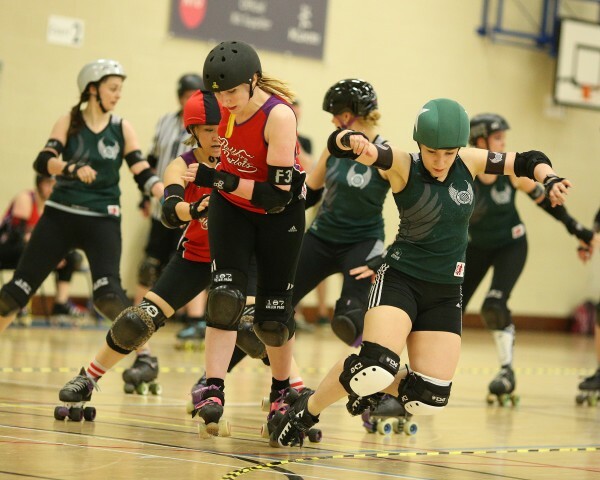 On Saturday 27th June at Nottingham Trent University, the Nottingham Hellfire Harlots hosted the most recent instalment in Tier 2 North British Championships of roller derby. 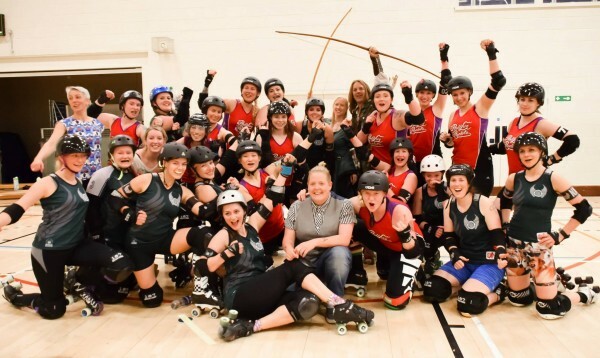 Four teams from Tier 2 of the roller derby British Championships (or British Champs) met again on the track with the Nottingham Hellfire Harlots taking on Manchester Roller Derby’s Checkerbroads and Newcastle Roller Girls facing Hull’s Angels Roller Dames. The Nottingham Hellfire Harlots took their third win of the tournament so far, showing Manchester whose house they were in and whose rules they were playing by with a convincing win against the Checkerbroads, delivering a score of 209 – 58. Newcastle also enjoyed a win in their game with Hull, 505 – 60. Rosie Peacock, Team Captain for the Nottingham Hellfire Harlots commented, “It was a very physically challenging game with the heat, humidity and Manchester’s tough defensive play. We’ve been working hard on breaking down opponent’s walls and this certainly paid off! The Nottingham Hellfire Harlots not only got to host two great games, the official Robin Hood and Maid Marion, Tim Pollard and Sally Chappell came to support the Harlots, watching the games and posing for pictures with fans. You can also come and see the Nottingham Hellfire Harlots at home again on 5th September, check out the team on Facebook.